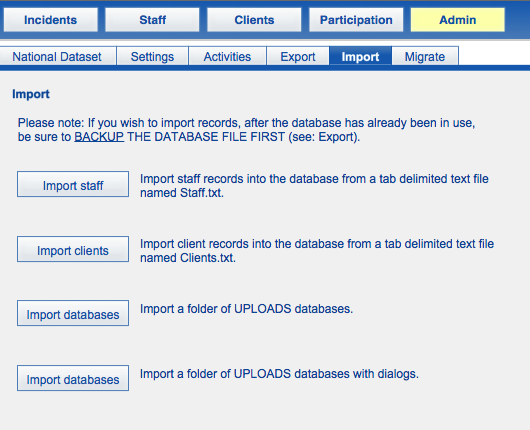 You are also able to import multiple staff records. This would be useful to do when first setting up the UPLOADS database. NOTE: Any records imported will be added, not updated. Make sure that you have not already added these records. In the Uploads > Import folder you will find a tab delimited file called “Staff.txt”. Enter the Staff records you want to import. Any column for which the organisation does not have data should be ignored (but not deleted). No columns should be added to the spreadsheet and the title row names should not be edited. After the data has been entered, save the spreadsheet as a tab delimited text file into the Uploads/Import/ folder (i.e. overwriting the original text file). Do not change the name of the file.